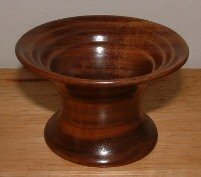 Black Walnut woodturning blanks inventory and prices! Black Walnut wood has a creamy white sapwood; the heartwood is a rich chocolate or purplish-brown in color; many of these blanks contain both colors. They yield interesting two tone turnings. Black walnut is normally straight grained and is noted for its beautiful grain character. Over the years the wood develops a lustrous patina. It is the only dark North American turning wood so it has a large following of devoted woodworkers that enjoy its rich color and ease of use.